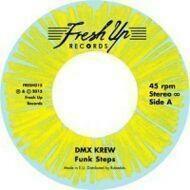 Two brand-new hard electro-funk jams for poplockers from label boss Ed DMX. Sure to be popular with funk and boogie revivalists as well as electro and breakdance fans. Funk Steps features a sparse, handclap-heavy beat, an arabian-style synth hook, some very greasy guitar playing and a vocoder lead vocal imploring the listener to get down and do their thing on the dancefloor. Space Fonk is an uptempo synth-funk number with squelchy synth bass, vocoder hook and live tambourine and guitar. Moogs and lazer zaps all over this one.